Our Lumber Carries a Limited Lifetime Warrantee. Dockmaster uses only the highest quality top choice pressure treated lumber for all framing and decking. All fasteners are galvanized steel. Our roofs are constructed using 1/2 inch plywood deck and 30 year architectural shingles in a variety of colors, or 24 gage standing seam color coated metal installed over 2x4 pressure treated purlings. also in a variety of colors. 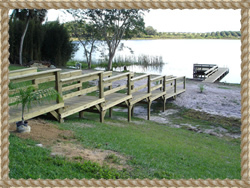 Dockmaster of Lake County, Inc. custom builds to suit our customer's waterfront needs and enjoyment. 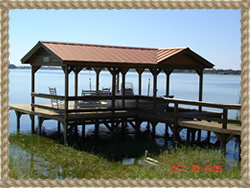 So whether you are looking for a small fishing pier, a home for your boat or a screened nighttime entertainment space, we work with you to build what you want. EverGrain Composite Decking - One look and you'll see the difference. EverGrain blends the natural beauty of real wood with the ease of composite. You’ll have a gorgeous deck that lasts, without the excessive maintenance of real wood. That’s right, no painting, no staining, no rotting and no termites.